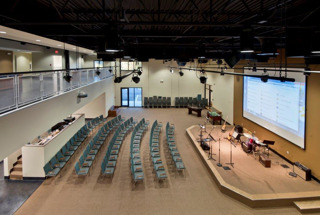 Center Point Community Church in Naples began as a Bible study in 1976, moved to its present location in early 1980, and in 2010 completed a major expansion and renovation of its facilities. The campus is located on 10-acres west of exit 105 on Interstate 75. The emphasis of this Naples church is on the thoughtful teaching and application of the Bible for the entire family, and cultivating a sense of community and support among those who attend. We want the worship style to be relevant, creative and an authentic response to who God is. The church maintains a dual focus—reaching out to those who are unsure of what they believe, while seeking to make disciples of those who have come to faith in Jesus Christ. Approximately 20% who attend became believers while at Center Point (see Values). We are truly committed to the vision of connecting one person at a time to a family of committed followers of Christ.